After more than a century and thousands of performances, Massey Hall is still the place many artists aspire to perform, largely because of its unique character designed to preserve the acoustics and intimate relationship between artist and audience. From the terrazzo lobby flooring and Moorish arches, to the original plaster ceiling and seats arranged to make patrons feel like they can touch the stage, there are many reasons why the Hall is a designated National Historic Site. But these same architectural gems that define Massey Hall are also some of the features in urgent need of restoration. A wire mesh has covered the crumbling ceiling since 1968; most of the seats haven’t been replaced in 70 years; there are no elevators, making the upper seating areas and bathrooms in the gallery and basement inaccessible for many; and the Hall’s two licensed areas — Centuries bar in the basement and the balcony lounge — can only accommodate a fraction of the total guests with limited access to washrooms. Bringing Massey Hall into the 21st century, while honouring its history and preserving its legendary acoustics is a top priority of the revitalization team. 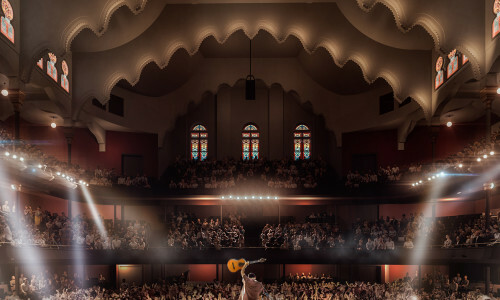 To accomplish these goals, Massey Hall is working closely with Heritage Toronto, architects specializing in the restoration of heritage buildings and a team of specialty consultants, including acousticians, lighting designers, architectural historians and conservationists. Overseeing the careful restoration and renovation of Massey Hall is Toronto’s KPMB Architects, the award-winning, internationally-recognized firm behind such projects as Koerner Hall at The Royal Conservatory TELUS Centre for Performance and Learning. KPMB Partner Marianne McKenna brings to Massey Hall a special focus on the architecture of concert halls and how design is used to engage community. She is supported in her efforts by Goldsmith Borgal & Company Ltd. Architects, a Toronto-based firm specializing in the restoration, rehabilitation and adaptive reuse of heritage buildings, and renowned acoustician Bob Essert, the founding director of Sound Space Vision with more than 35 years’ experience and over 150 projects to his credit, including the Canadian Opera Company’s Four Season’s Centre for the Performing Arts. Hidden behind plywood for decades, Massey Hall’s stained-glass windows were carefully removed and labelled before being gently cleaned and repaired by the experts at Vitreous Glassworks company. The unique and beautifully restored works of art will be a showpiece of the new Hall when it reopens in 2020. Stained Glass Preservation | Shine A Light on Massey Hall from Massey Hall Revitalization on Vimeo. Replace the 70-year-old seats on the main floor orchestra and throughout the balcony and add a parterre, a stage-facing seating area around the perimeter of the Hall to accommodate wheelchair seating. Install a deployable seating system that can transform the orchestra level into a standing room audience. Refurbish the original wood and wrought iron gallery seats with new wood and padded cushions. Restore the Hall’s more than 100 original stained-glass windows, covered since the first half-century. Return the Art Deco-style lobby to its original glory. Complete surface treatments to reinforce the original plaster ceiling, scallops and rafters. Clean and restore the exterior brick, stone and metalwork and the Hall’s trademark marquee sign. The planned acoustic innovations will bring the amplified sound to new levels of excellence, while retaining what the Hall is most known for: its warmth.